Mindfulness and meditation are two things that I'm working on...hoping to learn...hoping to one day make into a regular part of my life. Jack Kornfield has been working on this for a long time and has some wisdom to share. Let's begin with a basic question: What is mindfulness and why is it important? Mindfulness is an innate human capacity to deliberately pay full attention to where we are, to our actual experience, and to learn from it. Much of our day we spend on automatic pilot. People know the experience of driving somewhere, pulling up to the curb and all of a sudden realizing, "Wow, I was hardly aware I was even driving. How did I get here?" When we pay attention, it is gracious, which means that there is space for our joys and sorrows, our pain and losses, all to be held in a peaceful way. 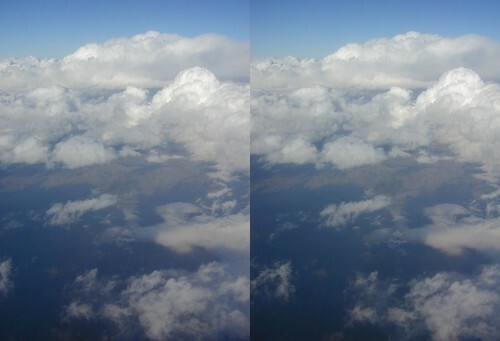 Here's something fun you can do on your next flight: take stereoscopic photos from your airplane window. It's not hard. Maybe your cameraphone will work, too!